The Israeli military says its Iron Dome system has been extremely effective against Palestinian rockets coming out of the Gaza Strip. 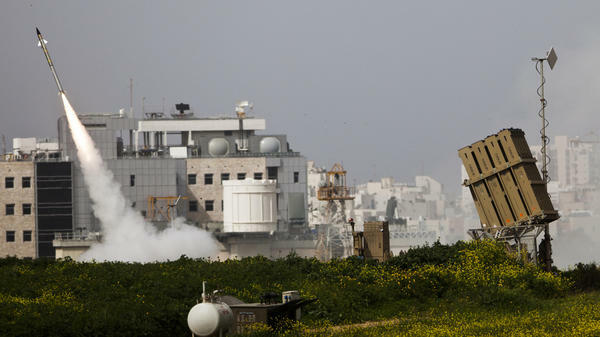 Here, an Israeli missile is launched Monday near the city of Ashdod in response to a Palestinian rocket. 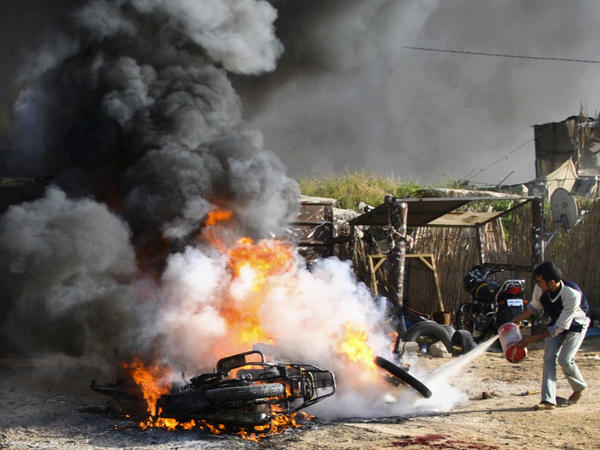 A Palestinian tries to extinguish a fire after an Israeli airstrike in Rafah in the southern Gaza Strip on Saturday. In the Gaza Strip on Monday, Palestinian families mourned their dead. Those killed included a 65-year-old farmer who was watering his tomatoes and checking on his greenhouses, his 35-year-old daughter, and a 15-year-old boy. Israel says Palestinian militants were hiding among the local population and firing rockets from northern Gaza into southern Israel. Palestinians in one Gaza community told NPR that militants had been operating in the area but said the civilians were innocent. This current round of fighting has claimed more than 20 Palestinian lives since last Friday, most of them militants. It's the heaviest fighting in months, and it began on Friday when an Israeli strike killed the head of the Popular Resistance Committees, a militant group Israel says was planning an attack from Egyptian territory — similar to one last August that left eight Israelis dead. In response to the Israeli action, several Palestinian militant groups have been firing rockets. Hamas, the radical Islamic group that controls the Gaza Strip, has been observing a cease-fire since a major clash with Israel three years ago and is not directly involved in this round of fighting. To date, Israel hasn't targeted Hamas leaders. Egypt, meanwhile, is trying to broker an end to the hostilities. Hamas spokesman Fawzi Barhoum told NPR in Gaza that Israel must back down first. "The ball is in the Israelis' court," he says. "They must stop their aggression." Israel says that it will continue and even expand its operation while rockets are falling on Israeli cities. So far, no Israelis have been killed and only a few have been injured — and Israelis say the main reason is the Iron Dome, its rocket defense system. On a hilltop in southern Israel, a radar is perched facing the Gaza Strip. Nearby is a battery of missiles that intercept anything deemed a threat coming from Gaza. The Iron Dome has had a 90 percent success rate, according to the Israel Defense Forces. "This is really the game changer from our point of view, because now, we have the full basket of options," says Brig. Gen. Doron Gavish, an Israeli air defense commander. "We have attack as an option; we have defense as an option. There were tens of rockets that were aimed at the cities of Israel that were intercepted by the Iron Dome system." Iron Dome has been viewed with suspicion by some inside the Israeli military, who argued that resources should be allocated for Israel's conventional military capabilities, such as tanks and airplanes. There are only three Iron Dome batteries deployed, but the public is now clamoring for more. While Iron Dome has been impressive, it's not infallible. In Ashdod, an Israeli coastal city just outside Gaza, a rocket landed in a residential area on Monday, shattering windows and terrifying the local population. Luba Boxer lives in an apartment building near the spot where the rocket landed. She says she heard the warning sirens and tried to get to the bomb shelter but there wasn't enough time. Then there was a loud explosion and glass was flying everywhere. As we spoke, there was a warning of another attack that sent everyone scurrying for the bomb shelters. After the danger passed, we made our way outside and were told that this time the Iron Dome intercepted the rocket. And I'm Audie Cornish. In the Gaza Strip today, three Palestinian civilians and two militants were killed in Israeli air strikes. That raises the death toll in Gaza to 23 in four days of violence and dozens of rockets have rained down on southern Israel, causing several injuries. NPR's Lourdes Garcia-Navarro has the story. LOURDES GARCIA-NAVARRO, BYLINE: In Gaza today, families were mourning their dead. SUFIAN EL HUSUMI: (Foreign Language Spoken). GARCIA-NAVARRO: Sufian el Husumi(ph) is the uncle of one of those slain today. He was 65 year old, Sufian says, and he worked the land. When the Israelis fired, he was watering his tomatoes and checking on his greenhouses with his 35 year old daughter. She also died in the air strike, he says. A 15 year old boy was also killed today in Gaza. Israel says the civilians died because militants were hiding among the local population, firing their rockets into Israel. People in one Gaza community told NPR that militants had been operating in the area, but say the civilians were innocent. This current round of fighting, the worst for many months, began on Friday, when Israel assassinated the head of the popular resistance committees. A militant group, Israel said, was planning an attack from Egyptian territory similar to one last August, which left eight Israelis dead. In response, several militant groups began firing rockets into Israel. Hamas, which controls the Gaza Strip, has been observing a cease fire since the end of the Gaza War three years ago and it's not believed to be directly involved in this round of fighting. To date, Israel hasn't targeted its leaders. Egypt is trying to broker an end to the hostilities. Hamas spokesman, Fawzi Barhoum, told NPR in Gaza today that Israel must back down first. FAWZI BARHOUM: (Foreign language spoken). GARCIA-NAVARRO: The ball is in Israel's court, he says. They must stop their aggression. Israel, though, says it will continue and even expand its operation while rockets are falling on Israeli cities, and today, they did in numbers. But there have been few Israeli casualties and the main reason is what is called Iron Dome. On a hilltop, a radar is perched facing the Gaza Strip. Nearby is a battery of missiles that intercept anything deemed a threat coming from Gaza. Iron Dome has had a 90 percent success rate, according to the Israel defense forces. Brigadier General Doron Gavish is an Israeli Air Defense Commander. DORON GAVISH: This is really the game changer from our point of view because now we have the full basket, I would say, of options. We have the attack as an option and we have the defense as an option. Tens of rockets that will aim to the cities of Israel to intercept it by the Iron Dome system. GARCIA-NAVARRO: Iron Dome has been underfunded until now. It was viewed with suspicion by some inside the Israeli military. They lobbied for scarce resources to be allocated to Israel's conventional offensive capabilities, tanks, airplanes. There are only three Iron Dome batteries deployed, but the public is now clamoring for more. But while Iron Dome is impressive, it's not infallible. In the city of Ashdod today, a rocket landed in a residential area, shattering windows and terrifying the local population. LUBA BOXER: (Foreign language spoken). GARCIA-NAVARRO: Luba Boxer lives in an apartment building near where the rocket landed. She says she heard the sirens and tried to get to the bomb shelter, but there wasn't enough time. Then there was a loud explosion and black smoke, she says, and glass blew everywhere. GARCIA-NAVARRO: As we were speaking, there was a warning of another attack, sending everyone scurrying again for cover. So we're now coming into the bomb shelter with the residents of this building and, indeed, the sirens have gone off again and now we're having to come in here. GARCIA-NAVARRO: As we made our way outside, we were told that, this time, the rocket was intercepted by Iron Dome. Luba Boxer wants it all to stop. All we want, she says, is to be safe.